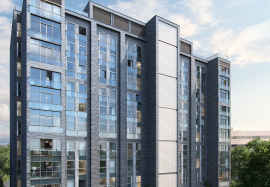 Insignia offers a selection of new luxury apartments within the centre of Manchester’s most famous sporting landmarks, with prices starting from just £165,500. Comprising one, two and three bedroom apartments with parking, a roof terrace and residents-only gym, Insignia meets the demand for contemporary housing from the multitude of young professionals and students within the city. Manchester has witnessed Capital Growth increase of 7.8% between June 2017 and June 2018, indicating that even within an uncertain market the growth in this city is continually strong. Manchester has the highest concentration of 20-34 year olds in the UK, the prime demographic for Insignia. The development has been appraised for lettings with an average yield of 5.9%, with projected rental incomes of between £9,300 and £15,600 throughout the development – the ideal turnkey investment for all property investors. Insignia is due for completion in Spring 2020 and the luxury units are available to reserve now. To find out more about this exciting opportunity contact the New Homes team on 01903 890051 or via email on newhomes@leaders.co.uk.